Here is our gallery with all our Manga / Anime coloring pages. These Japanese comics are more and more popular everywhere in the world. We mostly present original and exclusive drawings imagined and drawn by our partner artists, with Chibi and Kawaii characters to color. If you are passionate by Dragon Ball Z, Naruto, One piece, or other Manga characters, this gallery is also for you. 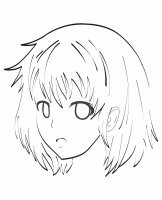 New : You can learn how to draw Manga / Anime drawings with our exclusive Tutorials !